November 25 is the feast day of St Catherine of Alexander. Chances are, St Catherine isn’t someone you’ve heard of, beyond having a firework named after her, or more accurately after her mode of martyrdom – on a wheel. In my childhood, St Catherine was quite a well known figure. Well, not the saint herself exactly, but a hill named after her. I grew up in Winchester, Hampshire. It was the city that was the capital of the great Saxon kingdom of Wessex, and arguably the capital of England before London. Earlier than this, however, it was a Roman city. And even earlier than this, there was an Iron Age settlement (around 500BC), on a hilltop just outside the city. This hill is known as St Catherine’s and there was a 12th century chapel on the top of the same name, until it was demolished in 1537, I believe at the behest of that great money-grubbing vandal Henry VIII during the Dissolution of the Monasteries, in his massive pope-won’t-let-me-divorce royal hissy fit. When I was young and fitter and my knees worked properly I used to love running up there. It’s a wonderful place, and very much worth a visit. The views are good, there are orchids and other wild flowers, and there’s even a mizmaze, carved into the turf, with the winding path in exposed chalk. The form of such mazes is to an ancient, mysterious pattern, but this one is most likely from the second half of the 17th century. A local legend involves its creation being punishment for a pupil of the nearby privileged seat of learning and abject arrogance, Winchester College. St Catherine’s martyrdom in 310AD in Egypt on a wheel may also be the reason the hill is named after her, with the Iron Age ramparts forming a circular shape. Or it may just be because she is, among other things – wheels, obviously, librarians, knife sharpeners, hat makers, lacemakers, spinsters, etc etc – patron saint of hilltops. Or something. Such hagiography is a right shambles. Anyway, her feast day is 24 or 25 November. The date was also used to honour Catherine of Aragon, first wife of the abovementioned Henry, and the first victim of his desperation for a male heir. After 24 years of marriage, he blamed her for the lack of a living son, and changed the course of history to get shot of her. He had her imprisoned in Ampthill, Bedfordshire, 1531-1533. She became a patron of local lacemakers, and they began to celebrate her support on, naturally enough, St Catherine’s day. One feast day treat for St Catherine’s day is Cattern cakes. 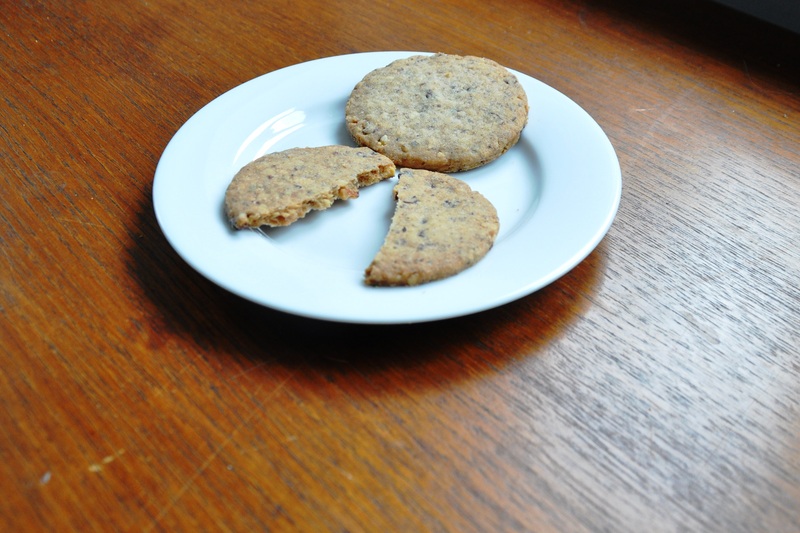 These are closer to what we’d consider a cookie or biscuit today, and are flavoured with cinnamon and dried fruit. I’ve got recipes in a couple of books: Cattern Cakes and Lace by Julia Jones and Barbara Deer and Cakes Regional and Traditional by Julie Duff. Only one includes the peel, while the other includes caraway seeds. I like the idea of both, so here’s my version. I’m only using self-raising flour here as I’ve got a lot in the cupboard. You could use plain instead, but use around 340g and 10g of baking powder. 2. Sift the flour, spices and salt into a mixing bowl. 3. 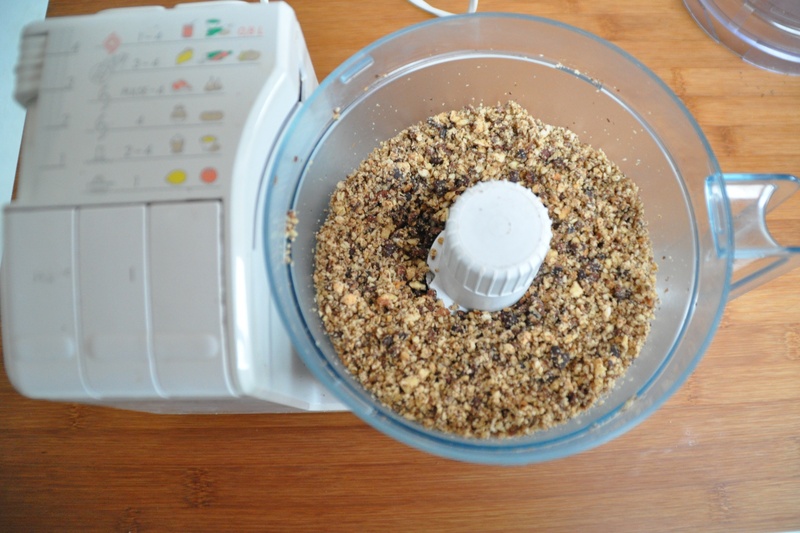 Add the sugar, ground almonds, dried fruit and caraway seeds. 4. Add the melted butter and beaten egg. 5. Bring together to form a dough. 6. 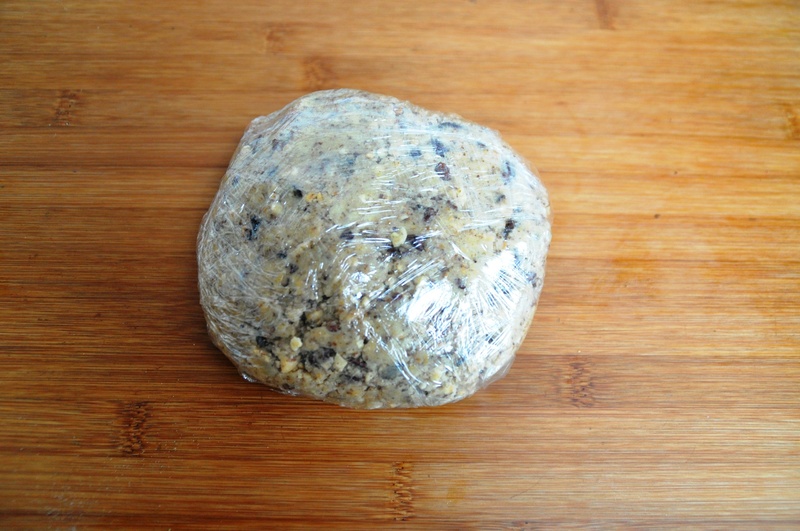 Bring the dough together, form a ball then cover with plastic and allow to rest in the fridge for about half an hour. This will firm the butter content up again. 7. Roll the dough out into a rectangle, about 12mm thick. 8. Brush the top with a little water, then sprinkle with extra sugar and cinnamon. 9. Roll the dough up like a Swiss roll to form a cylinder. It’s a pretty crumbly paste, but don’t worry: just squish it back together. 10. Cut into slices about 10mm thick. As above squish back together as necessary. Place the slices on a baking sheet, lined with parchment or silicone. 11. Brush the tops with the glaze. 12. Bake for about 10-15 minutes, until lightly browned. Despite the slightly fiddly dough, I like the results. They’re slightly unusual. One friend says “Christmassy” – but really, most feast day baked sweet treats involve similar spices and ingredients, such as peel, it’s just that we’ve lost so many of the other traditions, with most people’s only relationship with feast day foods being Christmas cake and plum pudding. They spread as they bake, and come out somewhat wrinkly, like cooled lava. You can see a swirl or spiral from the rolling up, especially underneath. The caraway, or Persian cumin (Carum carvi) is a bit of a divisive flavour though, faintly medicinal and almost medieval. It’s perhaps most commonly found in rye breads these days, but for a long time a great British classic was seed cake – a sweet, teatime cake flavoured with caraway. It’s one of those flavours that’s arguably gone out of fashion somewhat for the British palette. If you don’t like it, just leave it out. I’ll be in Winchester just after St Catherine’s day, so maybe we can go for a walk up the hill and take some of these for sustenance. Even if number one child, T-rex, has already rejected them, probably because of the caraway (unfamiliar flavour trumps sugary treat). Number two child, Stingray, is rather partial at least. Our toddler has been obsessing over the story of The Gingerbread Man recently. So it seemed only right that we started making actual gingerbread men together. Now, every time he grabs the book for me to read, he points at the gingerbread man on the cover and says, “We make some buttons!” Handling the mixture, rolling out a soft-ish dough, doing the cutting and transferring the pieces to a baking sheet aren’t exactly jobs for a two-year-old (see previous post), but he’s very happy to be given the task of sticking currants in to make eyes and buttons. Nothing fancy. No icing decorations. It isn’t Bake Off, it’s just father-son “do making”, making something he then ardently scoffs whenever we allow. Gingerbread is a fairly generic name that covers both soft cakes and a cookies, but I’m talking about those distinguished in the UK and US traditions from other ginger cookies by being cut into the shape of a man. One source on Wikipedia says they were first recorded as being made in England for the court of Elizabeth I, who reigned 1558-1603. Though ‘breads’ sweetened with honey and spices are quintessential foods for feast days and celebrations and have probably been made in Europe since the Middle Ages, if not longer. Various ginger-spiced biscuits and cakes can be found in the traditional feast day foods of much of Europe still, but notably in Britain, Germany (eg lebkuchen), Scandinavia, the Netherlands, Poland etc: that is, more northerly countries. It’s easy to imagine Medieval folks huddling round fires in the winter and very much appreciating feast day treats containing ginger, cloves etc, as such spices have a warming effect. Now, before I get to a recipe, I must talk a little about the story The Gingerbread Man. I love folk stories, fairytales, Märchen. I’ve read a lot, and I look forward to the kids being old enough for me to introduce more to them. I know full well they can be illogical, macabre and confounding to the modern mind, but The Gingerbread Man is downright weird. Here’s the gist, if you don’t know it, or need reminding. A childless couple (which obviously resonates) decide the way to overcome their sadness isn’t to, you know, visit an orphanage, but instead to bring forth life through the medium of baking. Indulging in some kind of dough-based witchcraft. I suppose it’s not unlike Gepetto carving a son out of a piece of wood in Pinocchio. When he reaches a river, a fox appears and offers to carry the gingerbread man across. The sentient – but none-too-bright – biscuit agrees. But the fox tricks him and in three tosses of his head, he eats him all up. Snap! Snap! Snap! And that’s the end of the gingerbread man. The moral of the story? Who knows. Maybe it doesn’t have one. It’s suggested that folk stories teach children about life, but it’s not always clear what the lesson is. The lesson here is not to be gullible or trusting of strangers, I suppose. Or alternatively to beware hubris. Certainly, the gingerbread man is a proud fool. Arguably the hero of the story is, instead, the fox. He’s cunning, and gets the snack. Cunning is quality in many cultures (eg the Italian concept of furbismo, which kept Berlusconi in power for so long), and is often exemplified by the fox, an archetypical trickster, in folk stories. There are other folk stories about runaway food in British, German and Easter European folklore – balls of dough, pancakes, bannocks – but the gingerbread man story appears to be a variation that evolved with migrants who settled in America. Whatever the origins or moral of the story, the boy loves it. Finding a recipe we could easily make together has been a minor challenge. Pre-children, I probably would have tried half a dozen recipes, but today, with two under-threes, I tried just three recipes. One from Dan Lepard’s Short and Sweet, one from Leith’s Book of Baking by Prue Leith and Caroline Waldegrave and one from Geraldene Holt’s Cake Stall (a hand-me-down from my mum with a wonderful dated 1980s cover, where Holt looks like an Edwardian). The two main approaches for making gingerbread men involve melting together butter and sugar, then combining with flour etc, or rubbing the butter into the flour, and adding the sugar etc. The latter is easier, but frankly, the best one of the three I tried was Leith one, which involved melting. The dough was trickiest to handle, but the resulting cookies had a proper snap – suitably enough considering the gingerbread man’s fate in the jaws of the fox. Making the dough (or paste), then cooling it in the fridge to firm it up and relax the proteins isn’t exactly ideal if you have a small child chomping at the bit to “do making” right now! I tried to lull young T-rex by putting The Jungle Book on (it was a rainy day) but it still wasn’t ideal. So I suggest making a batch of the dough in advance, then freezing some or leaving it in the fridge until the optimal “do making” moment in your day. This is based on the Leith version, but tweaked somewhat. If you’re doing this with a small child, make the dough in advance to give it time to cool, so you can do the rolling, cutting and baking in one hit. 1. Melt together the butter and both sugars, stirring and cooking until the sugar has all dissolved. 2. Take off the heat, allow to cool slightly, then beat in the egg. 3. Sieve together the flour, baking powder, spices and salt. 4. 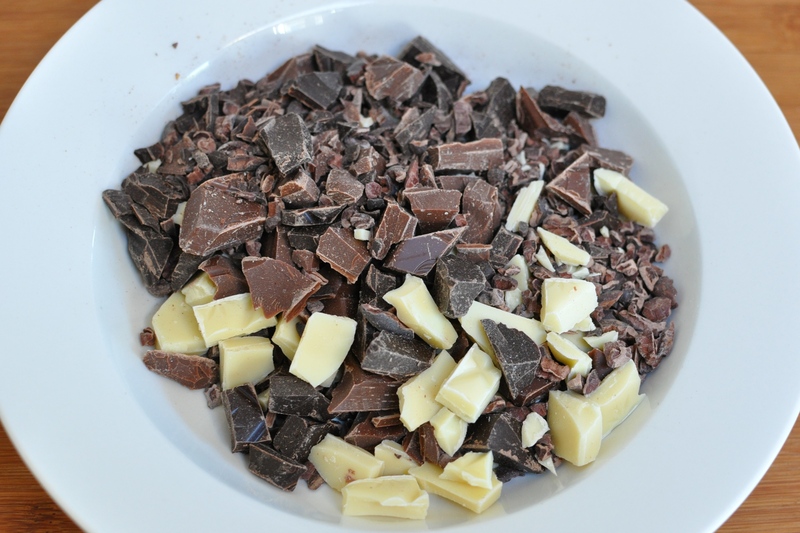 Put the sieved mixture into a bowl then gradually add the butter, sugar and egg mix, combining to form a homogenous mixture. 5. It’s a very soft dough, so put the bowl in the fridge to cool it completely. Then you can divide the mixture into slabs, and keep one in the fridge for a day or so until you want to do the baking. You can also freeze it. 6. 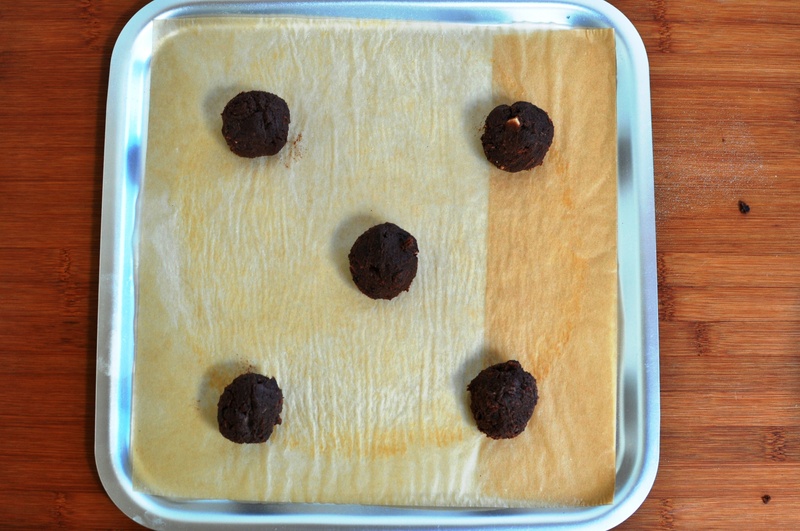 When you’re ready to roll, heat the oven to 180C and line baking sheets with parchment or silicone. 7. 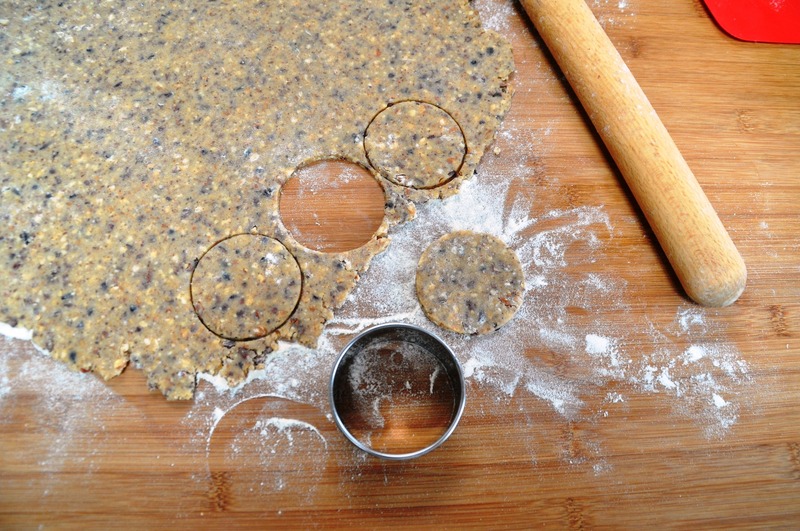 This dough warms up easily and gets soft, so to cut out the gingerbread men, do it in portions. Roll to about 4-5mm thick and cut out your men. We have a cutter about 13cm tall by 8cm armspan. Decorate with currants for eyes and buttons if you like. 9. Bake for about 10-12 minutes until nicely brown. Leave to firm up on the tray for a few minutes then transfer to cooling racks and allow to cool completely. They should crisp up as they cool. 10. Satisfying the obsession of toddler. Briefly. This is, obviously, a tricky area. I love to bake; he loves sugar; I try to be a responsible parent and not allow him too much. I want to nurture a sane relationship with food, where sweets are treats. This is a challenge as refined sugar is so addictive small children rapidly get a crazy-eyed for it, something that’s exploited by the food industry and insufficiently regulaed. Just look at breakfast cereals, some are a third sugar. But that’s another story, another rant. Run, run as fast as you can, I’m a two-year-old on a sugar rush…. 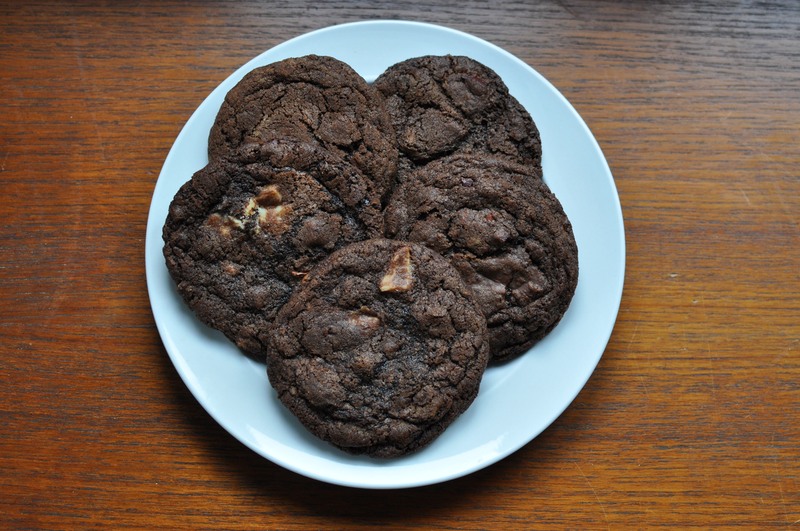 Lots of bloggers and columnists have offered recipes for “the ultimate chocolate chip cookie”. I’m not sure it’s entirely possible to nail a perfect version of the quintessential US cookie and, well, it’s fun to play around with recipes. I’ve been experimenting with adding more chips and nibs. Others before me have taken the triple chocolate chip cookie as a starting point for quadruple and quintuple, so I’m not claiming any originality here, just having fun. Let’s be clear, the quintuple here means there are five types of cacao-based product: three types of chocolate chunks, nibs and cocoa powder. When I say cacao-based product, I mean things derived from the Cacao theobroma tree. The tree is a native of Central and South America, famously beloved of the Aztecs, appropriated by imperialist Europeans and now grown from Ghana to Vietnam. I talked more about Cacao theobroma and nibs in this post, so won’t go on about them again. 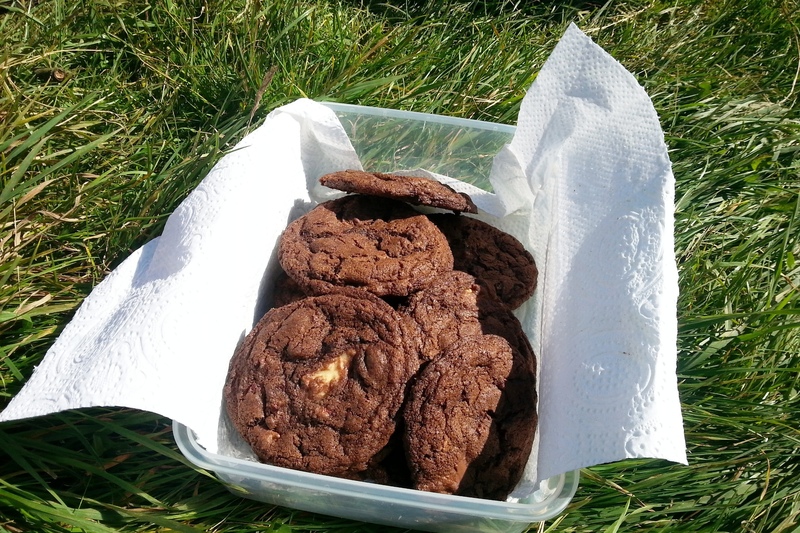 We ate this batch while having a lovely walk in the woods: Friston Forest in East Sussex. After saying in my previous post about how awful the weather has turned, we’re having a week of gorgeous sun. Friston Forest is lovely; I particularly enjoyed a moment where we walked up a shady path then were suddenly in a clearing that offered a view that was full to the horizon with trees. This isn’t something that happens very often in East Sussex, a part of England that’s fairly populous, heavily farmed or defined by open Downland scenery, not forest. 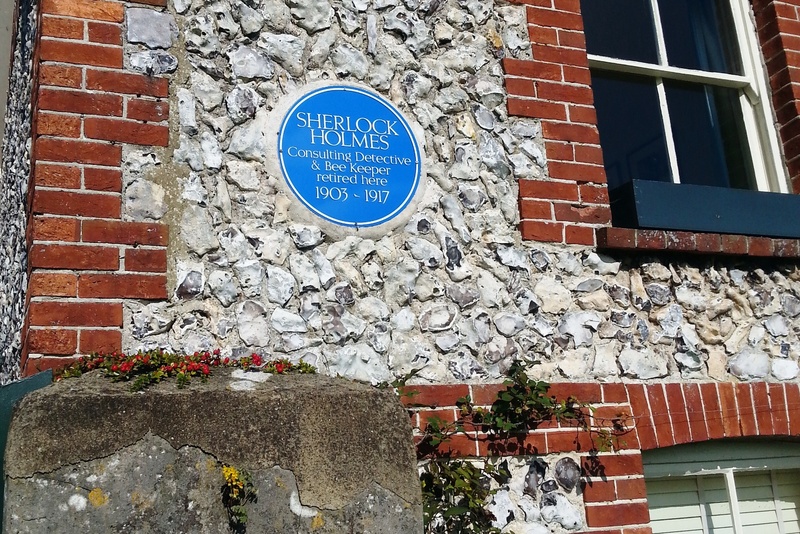 So it was a day of treats – cookies, sunshine, woody views and even a pretty decent pub lunch at The Tiger Inn in East Dean (not to be confused with the East Dean in West Sussex), opposite Sherlock Holmes’ retirement house no less. The only disappointment was the lack of edible fungi. Perhaps the woods – largely a mix of beech, sycamore and ash on thin soil over chalk – just aren’t that suitable. But that’s OK, it’s all part of the process of finding a good spot for foraging. 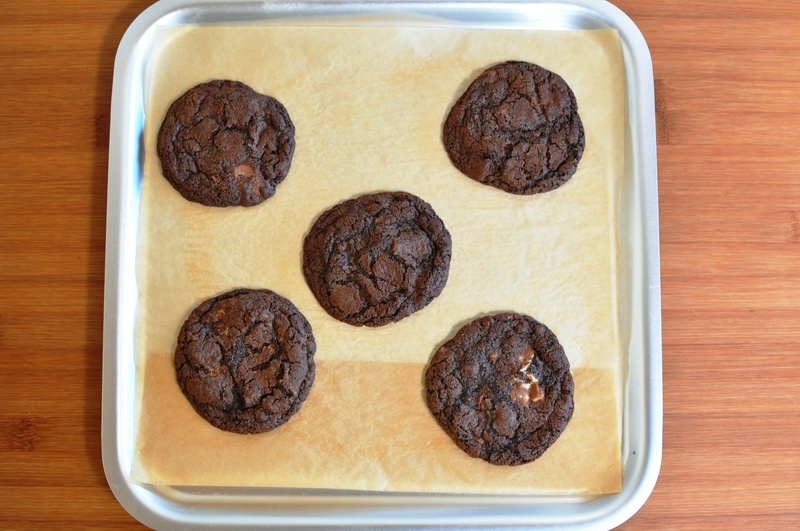 This recipe is based on Dan Lepard’s dark chocolate chunk cookies, in his book Short & Sweet. Rather than using the following technique and baking them straight away, he says you can also use the US or even German technique1 of forming the dough into a cylinder and fridge or even freezer for later. 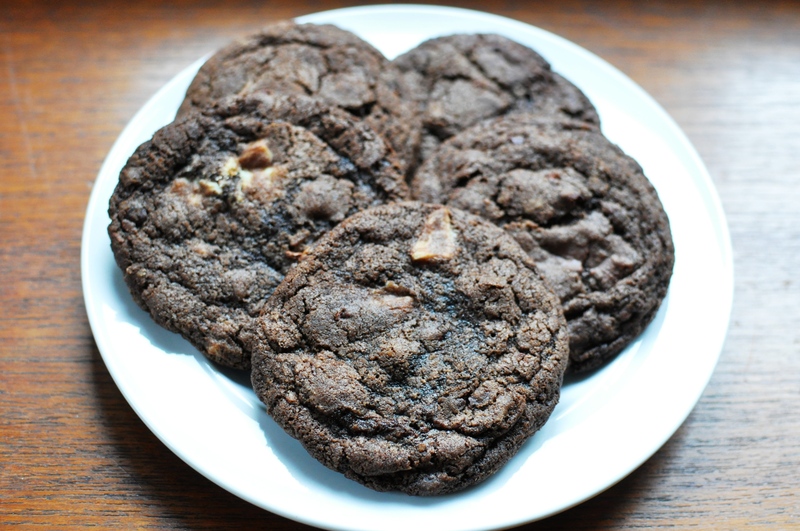 An article in the New York Times in 2008 asserted that this improves the quality of the finished cookie, allowing the flour to soak up the liquids and fats. Felicity Cloake in the Guardian did her own tests on this and said the dough kept longest in the fridge (48 hours) resulted in a more “caramelly” cookie, while those kept 12-24 hours had a preferable texture. I’m not entirely convinced though, especially when you’re adding cocoa powder to the mix. 1. Preheat the oven to 180C and line some tray with baking parchment or silicon sheets. 3. Add the add and vanilla essence, and beat to blend. 4. 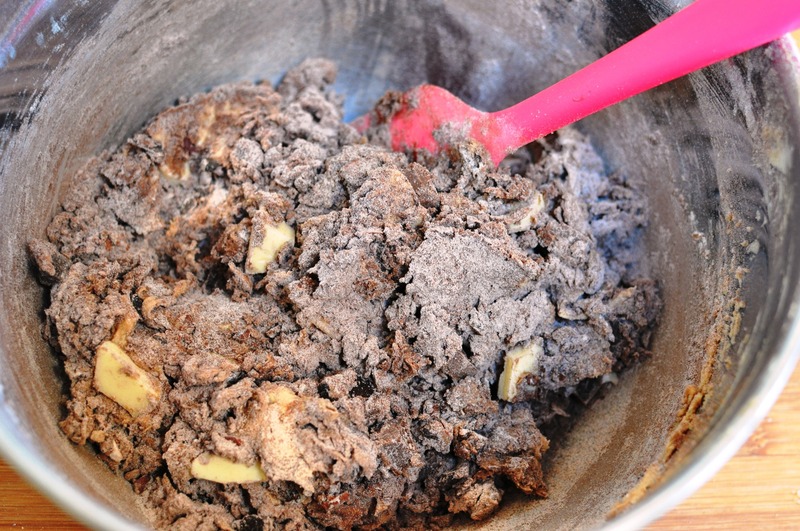 Sieve together the flour, cocoa powder and bicbarb then add this to the batter, along with the pinch of salt. 5. 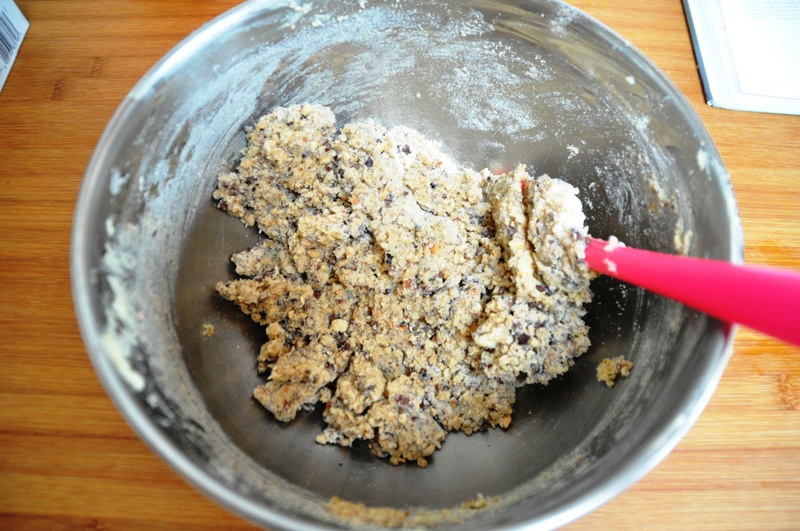 Add the chocolate chunk and nibs and bring to a dough. 6. Form balls. 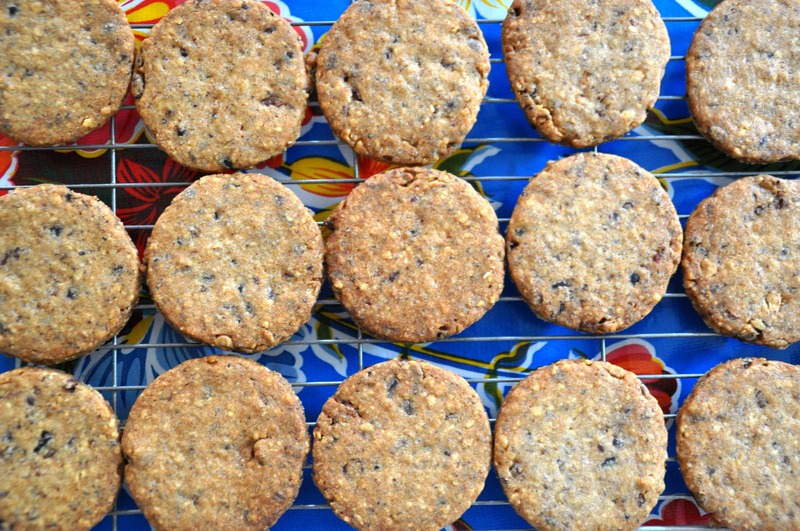 I scaled mine at 35g each, which resulted in 22 cookies. 7. Place the balls on the prepared sheets, well spaced about as they spread. 8. Bake for about 12-14 minutes. Less = chewier, more = crunchier, according to taste. 9. Allow to firm up slightly on the trays then transfer to a wire rack to cool completely. Enjoy. Not necessarily on a walk in the woods. With a teatime cuppa or evening hot chocolate in the comfort of your own home is good too. 2. Always bake with your eggs at room temperature. I’m not sure it makes any difference to taste but it does help when beating eggs into a creamed sugar and fat mixture, reducing the chance of curdling. It’s also better when making things that require the egg, or the white, to be whisked, as the warmer egg incorpates air more effectively. Personally, I don’t even store eggs in the fridge. Eggs have a great storage system already – it’s called a shell. If the egg is off, having it cold and off won’t make any difference.